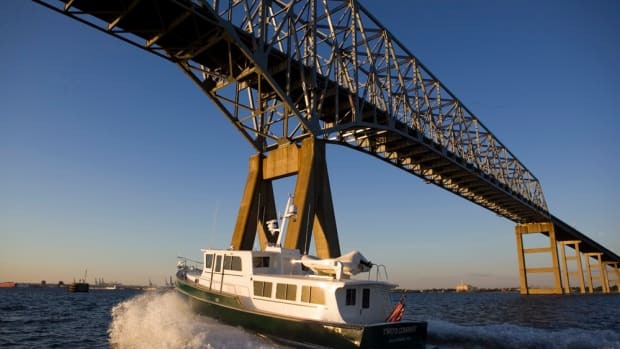 One of my favorite cruising grounds is the 218-mile length of the Intracoastal Waterway stretching from Charleston, South Carolina, to Fernandina Beach, Florida. The last time I made this trip, I was heading south on a new single-stateroom model of the Sabre 42 Hard Top Express with Bentley Collins, vice president of sales and marketing for Sabre Yachts. Collins and I, and two of his dealers, made the trek in early February to deliver the Downeast-style cruiser south for the Miami International Boat Show, with occasional overnight stopovers ashore to sample the winter golf and excellent restaurants along the way. We definitely had a schedule to keep, but the lure of the links was strong and we dawdled a bit, enjoying the crisp morning air that warmed more quickly every day we made some southing. Parting company with Collins&apos; dealers in Thunderbolt, Georgia, we continued south on the ICW, ignoring the general advice that a faster route with far less hassle from no-wake zones was available by running offshore. We would hear none of it. In this case, beauty would trump speed, at least for a while. As anyone who has traversed this stretch of the ICW can tell you, the winding route is dotted with towns large and small, marinas filled with well-worn shrimp boats and gleaming recreational boats of every description, and long stretches of golden saw grass fanning out broadly on either side of the waterway, punctuated by stands of pine and mixed hardwoods. Without question, there are shoals to mind and tides to consider, with plenty of chances to touch bottom for the skipper and crew that fail to pay close attention to the paper charts, the electronic chart plotter, and the view out the windows. A Downeast-style cruising boat like the Sabre 42 Hard Top Express offers the kind of protection from changing weather and outstanding views from the helm that make safe navigation and optimal enjoyment of your surroundings possible. Originally offered as a twostateroom cruiser, this boat has classic lines above the waterline, blended with a contemporary running surface. The entry is sharp forward below the waterline for smoother, drier running in a head sea, with significant chines for improved side-to-side stability and planing. And there is a nice flare forward, with full sections that hint at the living volume below. As with most of Sabre&apos;s designs, the helm deck under the hard top is raised to promote excellent visibility and to increase available space in the engine room amidships. Powered by a range of traditional shaft-drive diesels from Cummins and Yanmar, the Sabre 42 has recently been offered with Cummins MerCruiser Diesel Zeus drives. This powerful yet compact azipod drive system has moved the engine compartment farther aft, creating far more room at the after end of the saloon for a larger second cabin, and has added state-of-the-art virtues such as low-speed joystick handling for easier docking and a position-holding feature called "Skyhook" to an already-satisfying Maine-built design. Downeast-style boats typically have spacious aft decks, derived from the open decks of rugged workboats that had to carry tons of lobster traps and other commercial fishing gear. 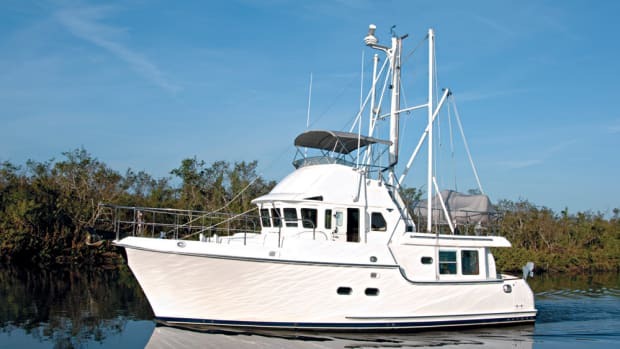 Because it uses more space for accommodations than true working boat designs, the Sabre 42 offers a cockpit with thigh-high inner sides for peace of mind. Two aft-facing bench seats, a double to port and a single to starboard, offer sun worshippers a place to abandon the protection of the hard top and soak up some rays without fear of going overboard. The transom door is substantial, offering easy passage to and from the fiberglass swim platform. Teak decking is available as an option on the swim platform, in the cockpit, on the side decks, on the anchor platform, and on the helm deck-all areas where safety underfoot is already outstanding. Standard safety considerations on deck are numerous. Large, molded steps lead up to the wide side decks, and there is a grabrail welded to the aft hardtop support on both sides to help you make the transition to the thighhigh stainless steel handrails that lead to the foredeck and surround the double-anchor pulpit. There is a sturdy teak toerail on deck to stop slipping deck shoes when conditions are wet, with stainless fairlead insets leading to large cleats set well clear of the walking path. A single Lewmar anchor windlass with a rope/chain gypsy serves the pulpit, which is designed to accept distinctly different styles of anchor to accommodate a wide range of bottom conditions, and there are twin lockers for chain/rope rode, fenders, and docklines forward. Like all lockers on deck, these have deep gutters to promote excellent drainage. Molded steps lead up from the aft deck to the helm deck, which features L-shaped Ultrasuede seating around a beautifully crafted table to port, an entertainment center with a Corian countertop and teak louvered doors to starboard, and two Stidd 500 series Ultraleather helm chairs forward. The helm deck can be optionally cooled or heated with reverse-cycle air conditioning, and owners have a choice of soft or hard enclosures across the aft edge of the hard top to make this more effective. We cruised south for several days with no enclosure, the heat blasting on cold mornings to ward off the chill, and found that the three sides did more than an adequate job of keeping us warm. When temperatures are milder and natural ventilation is the order of the day, there is an opening center section in the windshield, two Lewmar sliding hatches in the hard top with roller shades, and sliding windows on either side. Visibility from the helm is outstanding, as it is everywhere on the helm deck. Three windshield wipers with washers help keep your course ahead when rain or spray is present. The molded helm console, as is the fashion these days, has a semi-vertical face and space enough for a twin-screen suite of electronics and a selection of smaller instrument heads, a large Ritchie Navigator compass on top for easy reference, and a flat just ahead of the stainless-and-teak wheel for the digital engine performance panels. There is plenty of space between the adjustable Stidd and the wheel to allow comfortable standing when circulation is needed. The helm console is hinged to allow effortless access to wiring for diagnosis and repair, or upgrading, of your electronics. 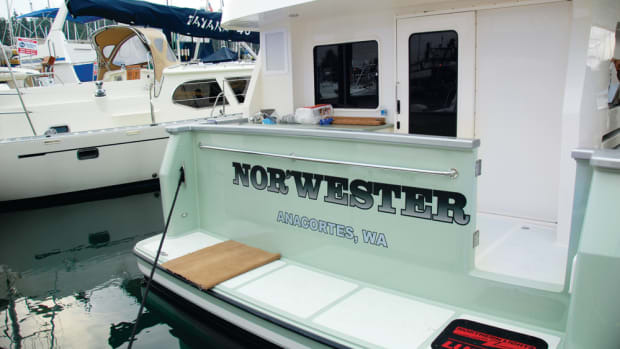 Throttles and trim tab controls are within easy reach, as is the switch panel controlling the engine room blower, horn, running/anchor/instrument lights, and other accessories. Louvered teak doors and three wood steps lead down into a saloon that is graced with varnished American cherry and accented with neutral designer fabrics. The handcrafted teak-and-holly sole adds to the traditional feel of the Sabre 42&apos;s interior, which is naturally lit and ventilated by opening, screened ports with a high-chrome finish. Headroom measures about 6 feet 6 inches, approximating the clearance under the hard top. Louvered locker doors add ventilation and traditional style while hiding clutter from the very contemporary appeal of the decor. There are good handholds throughout the interior. In the standard two-cabin layout, the L-shaped galley is located immediately to port of the companionway stairs, with a long settee and handcrafted high-low inlaid table just forward. On the starboard side, you&apos;ll find the guest stateroom and, moving forward, a large head compartment. The master stateroom is in the bow, with its own private access door to the head. The galley comes standard with a high-pressure laminate countertop, although the optional Corian replacement would be my choice for utility and beauty. A double Scandvik stainless steel sink offers enough depth to hold large pots or allow wet dishes to drain dry under way. Between the Seaward Gourmet two-burner electric cooktop and the Panasonic microwave/convection oven, the galley is set up to prepare hearty meals, although the lack of sea rails on the boat I tested caused me to wonder about the advisability of using the cooktop while under way. (I&apos;ve since learned that sea rails have been added to newer builds.) The Taylor Tundra under-counter refrigerator-freezer will hold sufficient stores for cruising a week at a time. If you&apos;re planning on being gone longer, consider the optional second freezer that faces the galley but is installed in the base of the guest stateroom hanging locker, wiping out drawer storage for guests. The guest stateroom opposite the galley offers a double berth with a foam mattress, drawers and storage under the berth, and a bureau with drawers below and a mirror-front locker above. A cedar-lined hanging locker completes the available storage. An overhead hatch and two opening ports bring natural light and ventilation. On the newer Zeus-powered models, this stateroom is considerably larger, with a 60-by-80-inch queen-size berth. There are several noteworthy features in the saloon. To begin, the L-shaped settee has storage beneath, as well as lockers outboard of the back cushion. One locker is the Sabre tool drawer, a nifty collection of tools with their own dedicated storage space. While it won&apos;t take the place of a full tool chest equipped to handle everything from electrical wiring repairs to water pump impeller replacement, it certainly is well equipped to handle small chores efficiently. Cantalupi lighting in the sound-deadening headliner panels provides plenty of illumination. A Corian vanity countertop and cherry cabinetry set off the head compartment, which features a circular shower stall equipped with a clear Plexiglas door. Remembering that owners will sometimes be moored or anchored out in less-than-calm waters, Sabre&apos;s designers have included a seat and a wet locker outboard and inside the shower, a very thoughtful detail. The Scandvik shower mixer control is a luxurious touch, and there is a ventilation blower to keep the steam moving outside. Jabsco&apos;s Quiet Flush electric freshwater marine sanitation device is standard equipment. In the master stateroom, the island double berth has a 6-inch foam mattress that was long enough for my 6-foot-3-inch frame to sleep on comfortably, with drawers and locker storage below. Cherry hull ceiling strips hint of wood-boatbuilding traditions, nicely set off by Cantalupi reading lights. A built-in bureau has a locker overhead for storage, and the hanging locker is furnished with cedar lining and a louvered door that should help hanging clothes stay fresh. A tour of the engine room, accessed through a hatch in the saloon sole, shows substantial engine beds that are constructed with steel caps over foam/plywood-cored fiberglass stringers. The hull is fabricated using iso/NPG Sport Yacht white gelcoat for a flawless outside layer, a vinyl ester backup layer resin, and knitted biaxial fiberglass laminates engineered for optimal strength and minimal weight. Hull sides and bottom panels are vacuum-bagged Divinycell PVC foam core, while endgrain balsa is used to core the deck and cabin mold, for stiffness and added strength. Soundown insulation materials are widely used for sound attenuation. In traditional propulsion configurations, a pair of standard Yanmar 440hp diesels equipped with ZF gears turn 2-inch Aquamet 22 stainless steel shafts through PSS dripless shaft seals, driving four-bladed nibral propellers braced by manganese bronze struts with rubber cutless bearings. Twin bronze rudders with bronze stuffing boxes, driven by Teleflex hydraulic gear, provide positive steering. Twin Bennett drop-fin trim tabs with dual actuators are mounted on the transom-very helpful for balancing the boat along the centerline in a heavy crosswind. Groco engine intake strainers and Racor fuel-water separators with water level alarms are located along the centerline for easy inspection. Seawater-cooled engine exhaust passes through inline horizontal mufflers and exits through side outlets to minimize noise and fumes. A fuel polishing system and a Reverso oil changing system are both attractive options. 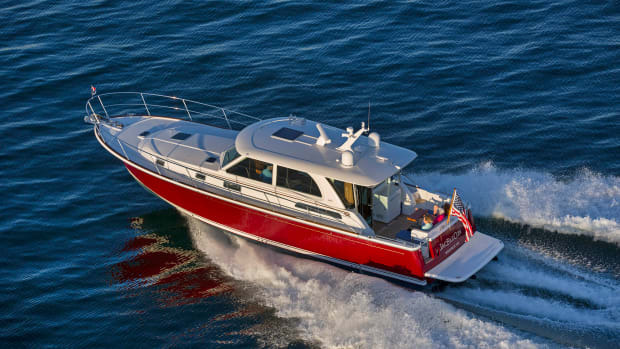 The onboard electrical system includes an 80-amp, 12VDC alternator on each engine, two Group 31 leadacid dedicated starting batteries, and two 8D Lifeline AGM deep-cycle house batteries. A ProMariner 50-amp, three-bank battery charger is standard, as is the 11.5kW Onan genset with sound shield, while a Heart inverter and Glendinning cord reel are optional. Battery disconnect and emergency crossover switches are found in the engine room; this setup would be ABYC compliant if the switches were remotely actuated. Fuel shutoffs are properly located in the lazarette. 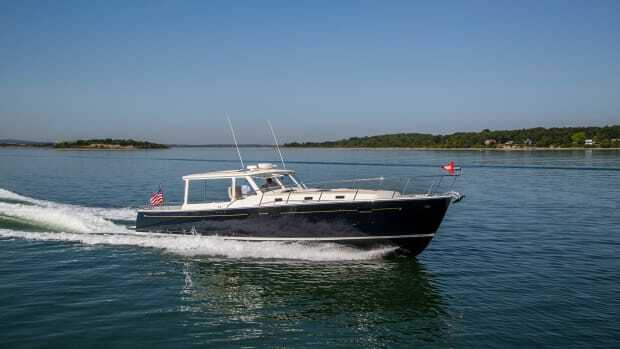 Driving the Sabre 42 in the sometimes twisting, often narrow channels of the Intracoastal Waterway is huge fun. And when the time comes to slow down and mind your wake or take a long, appreciative look at the country surrounding you, the electronically controlled engines are more than up to the task. At a slow cruise of 8 knots, Yanmar test figures show that the twin 440hp diesels burn 9gph for a range of 360 nautical miles (factoring in a 10 percent reserve of fuel). Up your pace to 20 knots-an efficient speed when time is of the essence-and the Sabre 42&apos;s fuel burn increases to 20gph, or an efficiency of 1 mile per gallon, but range improves to 405 nautical miles. Now for the new propulsion option. Cummins MerCruiser Diesel data show that, when equipped with a pair of 425hp Cummins Zeus 3500 (QSB5.9M) diesels, the Sabre 42 burns 4gph at an 8-knot cruising speed, for a whopping 747-nautical-mile cruising range, based on a 420-gallon fuel load. Bump up your speed to 30.5 knots, and the fuel burn rises to 41gph, effectively halving the range to 325 nautical miles. Such are the power and attraction of low-drag azipods for owners who want the choice of running at higher-than-displacement speeds. Opting for Zeus drives carries all sorts of benefits, not the least of which is the larger guest stateroom with queen-size berth. This option also provides room in a machinery space just ahead of the engine room for a combo washer/dryer and a freezer. The exhaust no longer streams out the sides, but exits through the hub of the counter-rotating props. Zeus drives also feature automatic integral trim tabs that work well all by themselves or can be adjusted manually if necessary. The pods swing independently through an azimuth that makes turns crisper, tracking straighter, and positionholding a hands-off exercise. This is truly the next generation in propulsion for semi-displacement boats. At the end of the day, our trip south on the ICW was fulfilling for the sights we saw, the golf we played, and the distance we covered in the allotted time. Whether you see this stretch of coast at displacement speeds, planing speeds, or a mix of both, if you&apos;re lucky enough to experience it from the helm deck of the Sabre 42, you&apos;ll enjoy every nautical mile.